I was hooked by the first paragraph! In fact, I did a book talk for my students on this book only after having read the first chapter. That is unheard of for me. What's great about The Maze Runner is that it's sort of the boy's equivalent to The Hunger Games. As much as I've tried to get the boys in my classes into The Hunger Games, they just don't seem to connect with the female protagonist. 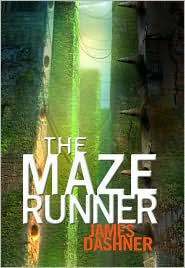 The Maze Runner has all of the dystopian suspense of HG but with boys as the main characters. I will say that the writing in this book is not nearly as lyrical as that of Suzanne Collins. It's a bit clunky and feels like you're far removed from the story rather than directly inside of it. Perhaps it's unfair to compare the two writers, but despite my fondness for this book, I sort of felt like I was in a fog as I was reading, whereas The Hunger Games always felt vivid and clear as a bell. Had this been written in first-person I think that might have helped to engage better with the story. At the same time, I think that the plot-driven suspense will help boys better to engage with the book than the more character-driven (and female protagonist) Hunger Games. The movie was better than the book? Say it isn't so! A couple months ago, I declared here on my blog that I had abandoned the book Julie & Julia due to its crassness. Given what an iconic, almost regal figure Julia Child was, it almost felt blasphemous to read such obscenities and narcissism in Powell's memoir of her year cooking Julia's recipes. 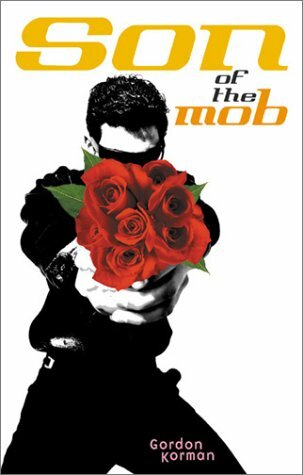 So this is one of the few times that I'm actually declaring my love for a movie more than the book. I curled up on the couch this afternoon and popped in the DVD of Julie & Julia that I checked out from the library, and it is one of the most feel-good movies I've watched in a long time. I can't remember the last time I sat down to watch a movie and thoroughly enjoyed every single moment. Meryl Streep was brilliant, the food made my mouth water, it was funny and endearing without TRYING to be. And yet another pleasant surprise was Jane Lynch's performance as Julia's sister Dorothy. Given how accustomed I've become to watching her play larger-than-life, comedic characters (a la Glee and The 40-Year-Old Virgin), it was lovely to see her play such a dignified, subtle role. I guess it's only fitting that I watched Julie & Julia today given Meryl Streep's Golden Globe win last night. She not only played Julia, she became her. I loved every second of seeing her on film. Now that I'm thoroughly starving after watching all of the delectable (and even not-so-delectable, hello, aspic?) food scenes, I'm ready to purchase a copy of Mastering the Art of French Cooking, or at the very least, check it out from the library. 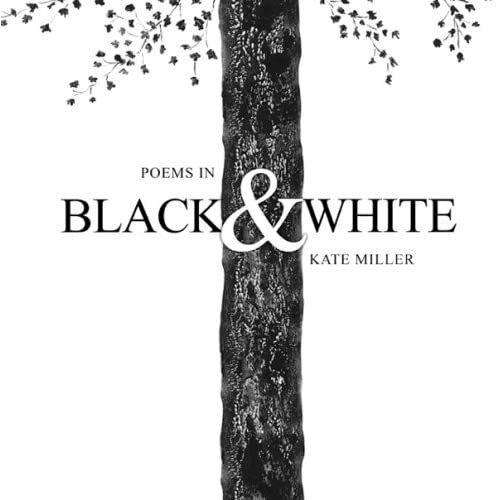 If I receive an ARC to review, I will promote the book on my blog, but I will also give my honest opinion based on my genre preferences, my impression of the writing, and/or whether I think it would be a book my junior high students would enjoy reading. I've recently been following along with the blog Lavender and Limes. I found it by perusing through other people's blogrolls and was fascinated with all of the pictures from India. I have always been fascinated by India. One of these days I would love to go there to see the Taj Mahal and the opulent palaces of Rajasthan. John Green is one of my favorite YA authors. Not so much because I think his books are brilliant (though I did absolutely adore Paper Towns) but because he and his brother Hank completely entertain me every week with their "Nerdfighter" videos they post on YouTube. If one brother does not abide by the rules they have created for each other, the other gets to punish the rule-breaker, which is always videotaped for posterity. If you're a fan of YA lit and you haven't checked out their vlog, you must. A few minutes ago my husband was channel surfing when he stopped to check the satellite guide to get a better idea of what was on TV. While he was checking the channel guide, the TV was on the Fox channel, which at that moment, happened to be playing the show Bones. Now I have never watched that show in my life, nor do I have any desire to, but at that moment, I was temporarily mesmerized by a character on the show playing a haunting Chopin nocturne. I immediately stopped what I was doing, closed my eyes, and experienced a feeling of pure bliss wash over me. Seeing as how The Husband was channel surfing, this moment of classical beauty lasted only about a minute, and then boom - the spell was broken. But it was a nice reminder of what an important part classical music has been in my life over the years. Ever since I was ten years old and heard Fantasie Impromptu for the first time, Chopin has been the composer that consistently tugged at my heartstrings. I could play Beethoven, Brahms, or Schubert, but Chopin is the one who always gave me the most satisfaction. Just to show you how much Chopin is loved in my house, this is the book that has resided on my piano for the past few years. At this point it's there more for decoration than frequent use. 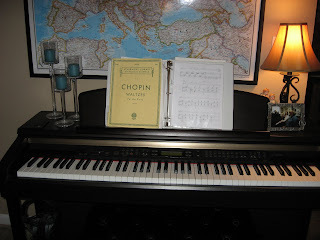 I hardly ever sit down to play anymore, but when I do, Chopin is always my go-to classical choice. What classical composer never fails to tug at your heartstrings? Brandish your highlighter when you read this book. There's lots of quotable material in here. In the world of "No Child Left Behind" and teaching to the test, Thomas Newkirk sees a disturbing trend in language arts instruction today. 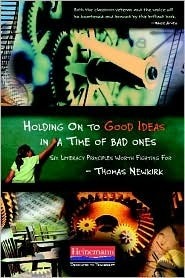 In this book he makes the case for effective instruction rather than just state mandated instruction. We need to stop thinking about standardized tests and scientific "sameness" in how we teach, and instead take pleasure in those spontaneous teachable moments that arise from our own students. We need to throw away the state standards that require us to "cover" a ridiculous, unattainable amount of material, and relish in the PLEASURE of expressive writing and independent reading that will motivate students to become lifelong learners rather than resent the institutions of learning. My only major critique of this book is the large number of typos I came across throughout my reading. It was disappointing because it kind of diminished the power of his message a little bit. Other than that though, it is a wonderful, career-affirming book to read if you're a language arts teacher. His laugh reminds me how sugar cookies are always ready when I get to his house. And they're always amazing. How the candy orange slices are always in a jar on the counter. I walk in and ask, "Where are the orange slices?" as if I didn't already know. The entire piece was so touching, but those passages really just tugged at my heartstrings. I hope he doesn't mind that I quoted his writing here. Be seen, still be understood. Not hear the cries of the drowned. May fears always have names. May we be outlived by our sons. Remember the holes in the ground. Be seen by those in the sun.